In addition to the known connection to other congenital conditions, a strong link has been established between Zofran use in the first trimester of pregnancy and the existence of cleft palate or cleft lip in children of mothers using the medication. Understanding what cleft palate is, the long term effects it has on sufferers and the treatment of the condition helps to make the case for holding the makers of Zofran accountable for providing damages to its victims after marketing the drug illegally and without conducting any research to determine whether the medication was indeed safe for use during pregnancy. 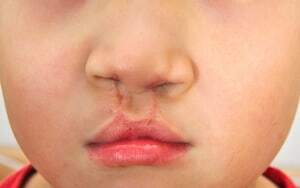 Cleft palate and cleft lip are both conditions that have physical and psychological effects which require years of therapy and treatment to overcome and it is fully in the rights of the parents of children affected by Zofran use to seek compensation from GlaxoSmithKline for its role in their children’s injuries. Rosenfeld Injury Lawyers LLC is actively investigating a pursuing Zofran lawsuits on behalf of children who have cleft lips and other facial deformaties after Zofran exposure. What are Cleft Palate and Cleft Lip? The palate is the roof of the mouth and it keeps the mouth separate from the sinus cavity. It also functions to help make certain sounds during speech and to form some words. A cleft palate is a hole in the palate that allows air to travel between the mouth and the sinus cavity. Cleft lip is similar and often exists in addition to cleft palate, but instead of the palate being deformed, a portion of the lip is undeveloped or deformed. Children with cleft lip are often subject to ridicule because of how noticeable the physical deformity is and the effect it has on their speech. In addition to making it difficult to speak, cleft palates and lips are linked to other serious conditions. The palate is supposed to keep fluids and air from entering the sinus cavity through the mouth and the fluids entering the sinuses through the mouth can cause infections and hearing loss. Loss of suction associated with cleft palate and cleft lip can also make swallowing difficult and impair the development of the jaw and teeth. The treatment of these conditions is initiated at a very young age and continues throughout the patients’ entire childhood— often until the age of eighteen. At some point in the first six months of the child’s life, doctors will recommend an initial surgical procedure to address the cleft palate or lip. The goal of this procedure is to form a functional palate that will keep fluids from entering the sinus cavity through the mouth. It will also aid in the development of teeth, the jaw and other facial bones that will ultimately be responsible for the child’s appearance later in life. This surgery is one of multiple procedures that the child will need to undergo throughout his or her life. At around eight years of age, a bone graft may be required if it is determined that the child’s permanent teeth and upper jaw will not be able to develop properly otherwise. Additional surgeries may be required to address speech impediments and once the teeth have come in, children with cleft palates are usually required to wear braces and undergo other orthodontic procedures to address the alignment of their teeth. Surgeries for those with cleft lip may leave scars on the child’s face that cannot be repaired until they are sixteen to eighteen years old. While treatment is usually successful in restoring oral functions and repairing the damage to the patients’ appearances, it comes at the cost of many different procedures and a practical lifetime of treatment. If you were prescribed Zofran during your pregnancy and your child now suffers from a cleft lip or palate, you have the right to demand compensation for your child in the from of a lawsuit against GlaxoSmithKline for irresponsibly pushing a product that is now known to cause birth defects and deformities. You may be entitled to receive damages in the form of medical bills and out of pocket expenses related to the ongoing treatment and procedures that your child must undergo over the course of his or her life and for the pain, suffering and emotional trauma that he or she must endure due to the condition and treatment. For more information on your rights or to find out if you have a case worth pursuing, contact us today to schedule a free consultation with one of our highly qualified attorneys. Rosenfeld Injury Lawyers LLC will be happy to review the details of your Zofran birth defect case and let you know how best to proceed and if we are unable to help you or cannot recover compensation on your behalf, our services will be free of charge. For up-to-date information about Zofran lawsuits, visit our Zofran lawsuit FAQ page.